There's an odd sense of gravitas to this for me, and I suppose it's kinda silly, but there it is. Looking at the art Rick is parting with, these are all pages from stories he and I have done together over the years. It's hard for me to not get sentimental. We're going to be offering the tiers in two batches, the first going up at 1pm Pacific today, the second at 2pm. There are 14 pages in all. I'm presenting the first seven pages here, the remaining seven in an update to follow. If you want to take a look at the high-res versions, I'll have a link in the description of each piece. 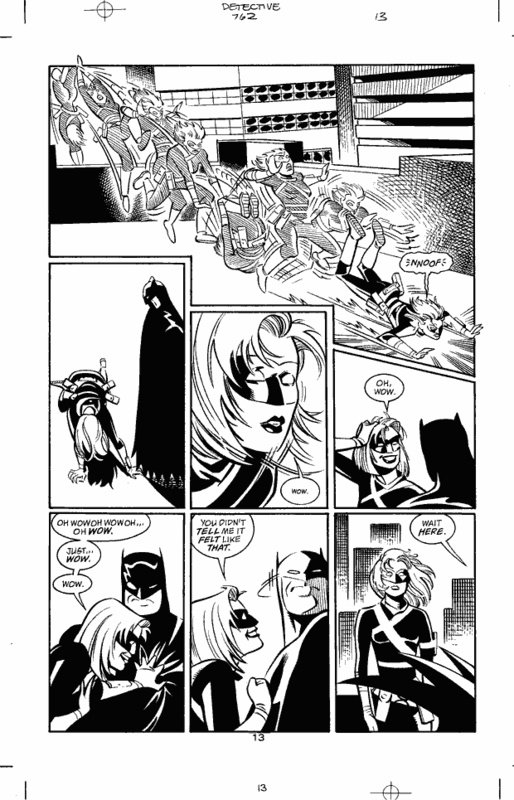 Pages are from Detective Comics, Batman/Huntress: Cry for Blood, Gotham Knights, Legends of the Dark Knight, Batman, The Batman 10-Cent Adventure, and Queen & Country Declassified II. Detective Comics 757, Page 3 - "Air Time." A one-shot short-story. A sentimental favorite of mine. Just another night in Gotham City, beginning with what Batman views as a failure in his mission, and ending with a the Dark Knight rescuing a family trapped in their car under water. Page will be signed by Rick and Greg, and will come with a copy of the issue in question, as well as the Cloth Covers edition of the trade, and the full digital package. 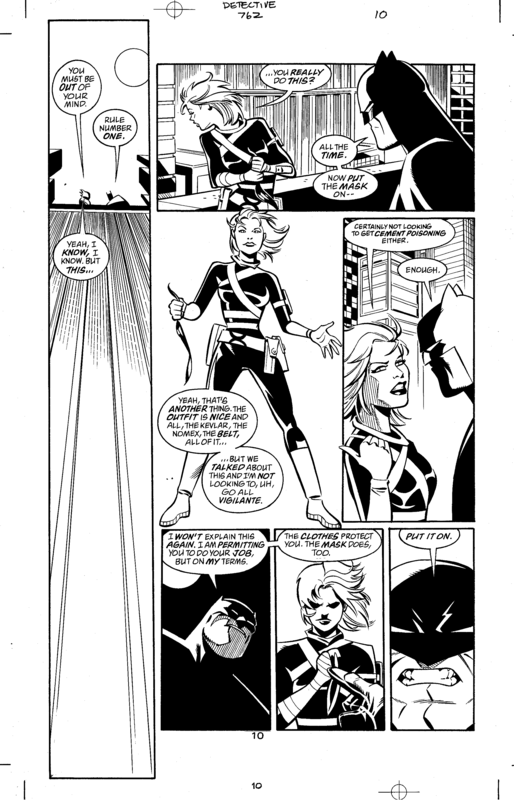 Detective Comics 762, Page 10 - "Passings." Bruce Wayne's bodyguard Sasha Bordeaux, forced upon him by the Board of Directors of Wayne Enterprises, has discovered what he's up to at night, and even though he's the Batman, she still insists on doing her job. To do so, she must follow Batman's instructions and join him in his vigilante activities. This story is her first night "on the job." This means she has to leap off of a skyscraper. She is… reticent. Page will be signed by Rick and Greg, and will come with a copy of the issue in question, as well as the Cloth Covers edition of the trade, and the full digital package. 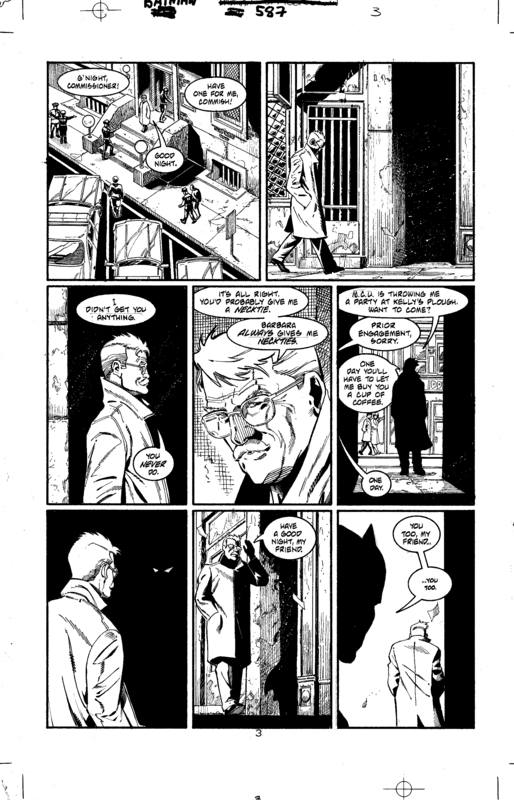 Detective Comics 762, Page 13 - "Passings." Having leapt, Sasha lands, and discovers what every costumed hero of Gotham City already knows - you can't buy that kind of adrenaline rush. Page will be signed by Rick and Greg, and will come with a copy of the issue in question, as well as the Cloth Covers edition of the trade, and the full digital package. 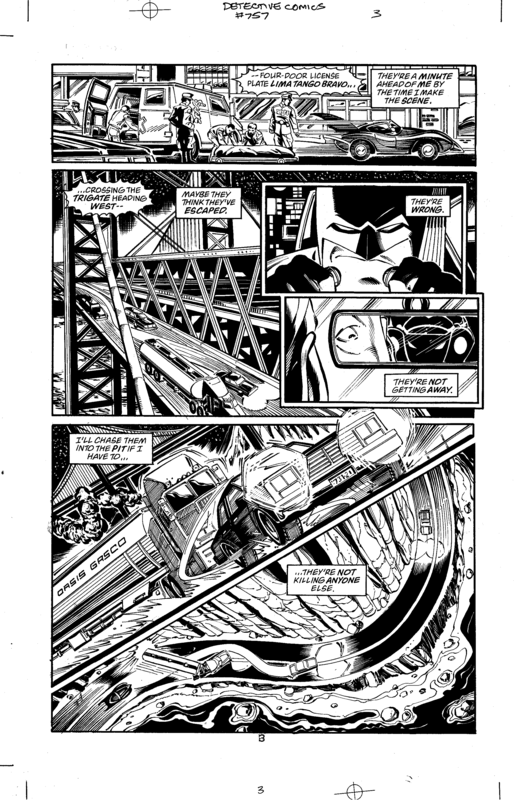 The Batman 10-Cent Adventure, Page 6 - "The Fool's Errand." This was a promotional book - as you can tell by the cover price - designed to give insight and articulation to just who Batman is in the then-current DC continuity. This is actually one of my favorite stories that I wrote, and one that Rick executed beautifully, I thought. 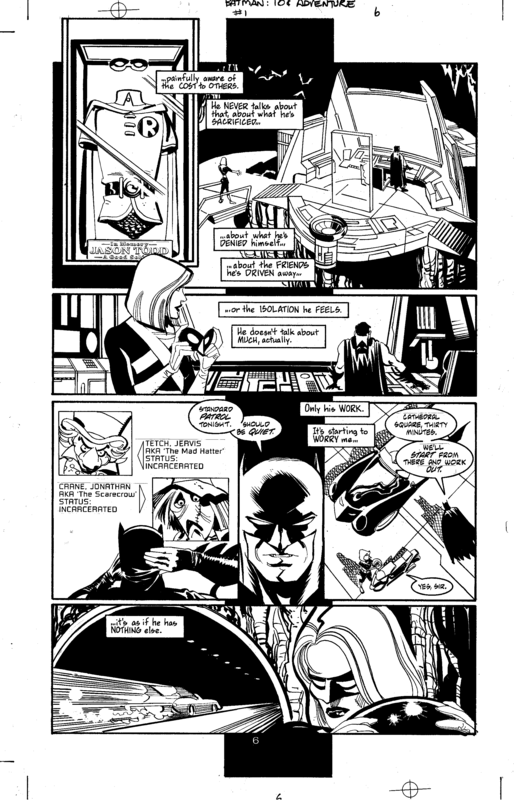 It's simply "an average night" for Batman, as seen through the eyes of Sasha Bordeaux. Page will be signed by Rick and Greg, and will come with a copy of the issue in question, as well as the Cloth Covers edition of the trade, and the full digital package. 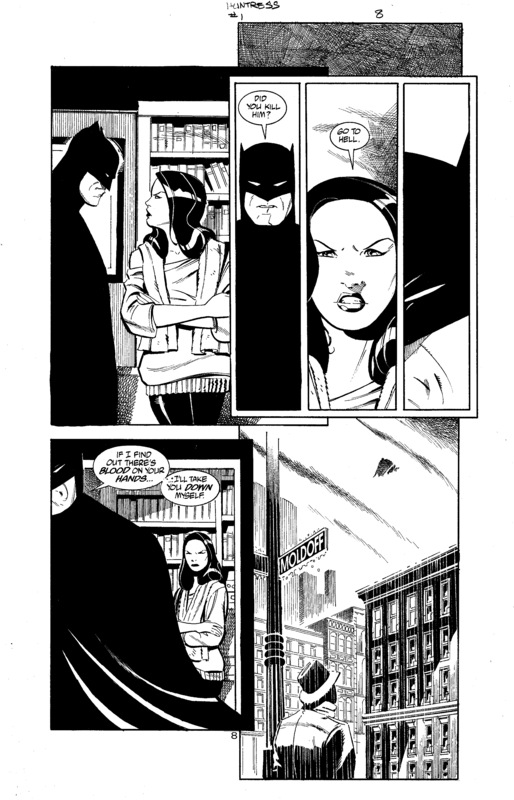 Batman/Huntress: Cry For Blood 1, Page 8 - "Cry for Blood, Part One." Batman pays Helena Bertinelli, aka The Huntress, a visit after one of Gotham's more notorious mafioso has been found dead with a crossbow bolt in his chest. Their relationship, always adversarial, is taking a turn for the worst. Meanwhile, Vic Sage, aka The Question, has had his curiosity piqued. Page will be signed by Rick and Greg, and will come with a copy of the issue in question, as well as the Cloth Covers edition of the trade, and the full digital package. Queen & Country Declassified II Issue 2, Page 9 - Freshly promoted Special Operations Officer Tom Wallace is sent to Hong Kong just before the colony is returned to China to investigate the mysterious death of an agent. He crosses paths with a Hong Kong police detective, as desperate to solve the crime as he. Page will be signed by Rick and Greg, and will come with a copy of the issue in question, as well as the Cloth Covers edition of the trade, and the full digital package. Again, these will go live as tiers at roughly 1pm Pacific time today. As I suspected all of the Original Art tiers are a bit out of my price range, but I'm really glad to see them. 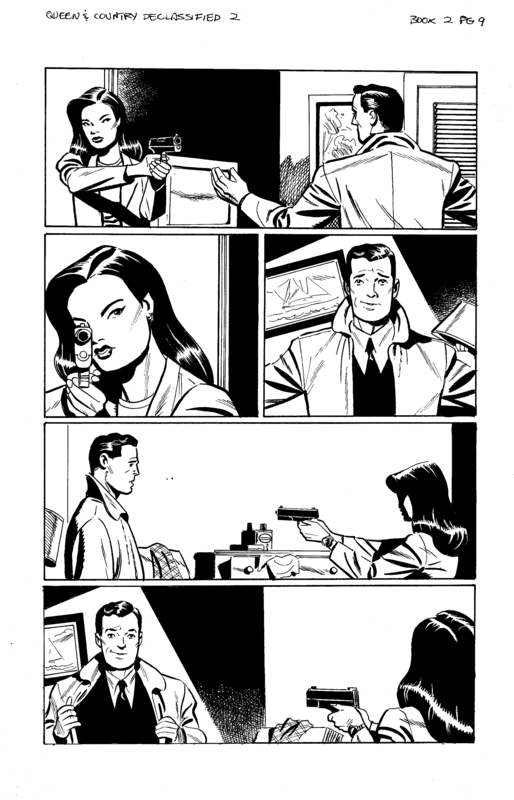 I wish I could spring for that Q&C young Tom Wallace page. And that was a deal at $350, when all of the pages with Batman on them were $400. Doesn't the law of supply and demand dictate that the Queen and Country pages be more expensive? There are billions of pages with Batman on them in the world and only a few hundred of Queen and Country. Thanks for being willing to part with them. Wow, when you look at most art sales, they tend to be the big splash page or action sequence. But these are some incredible compositions. I especially am fond of the Leap and a younger Tom Wallace. Wow! Those are some cool pages. Also, seriously awesome job giving everyone a 1 and 2 hour notice about this. It's really nice to give as many backers a possible a chance to hear about it and get ready. Wow.. Just wow. Any price indication?